Suffering an eye injury can be very painful. Blunt trauma injuries can be some of the most painful types of eye injuries. If you suffered a blunt trauma eye injury in an accident, you may have a case. Edgar Snyder & Associates is ready to help get you the money you deserve for your medical bills and pain and suffering. Blunt trauma basically means that an object pokes, protrudes, or otherwise damages your eye. Rather than a condition that develops over time, a blunt trauma injury happens suddenly and can cause serious medical problems. Blunt trauma eye injuries are common in car accidents, accidents involving a defective product, dog bites, fires and explosions, and workplace accidents. Contusions (bruises), etc. of the globe or globe lining, cornea, eyelids, etc. If you've been injured in an accident and you suffered blunt trauma to your eye, there are so many things to think about. You have your injuries to deal with. You may have to miss work, which may mean missed paychecks. 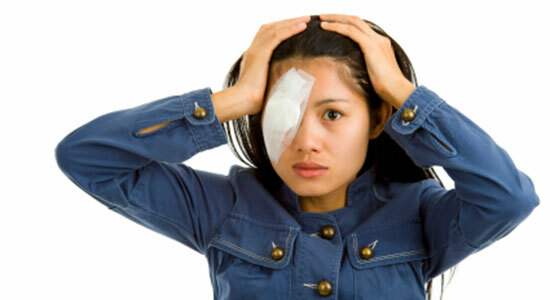 Medical bills pile up quickly, and you may need extensive care to recover from your eye injury. You might have scars. You may even need surgery. On top of everything else, the insurance company that covers the person at fault won't protect your best interest. They'll try to settle your injury claim for as little as possible. And then there's the emotional trauma you've experienced. We'll even come to you – in the hospital, at home, or wherever you are. The bottom line: We take care of the hassles, so you can focus on recovering from your eye injury. Best of all, there's never a fee unless we get money for you. If we don't get you compensation for your blunt trauma eye injury, you won't owe us anything. Since 1982, we've helped over 75,000 injured people get the money they deserve. Trust our law firm to do the same for you. Call 1-866-943-3427, or fill out the form at the top right of the page for a free legal consultation. Our phones answer 24/7, and there's no time to waste. Evidence starts to disappear quickly, and it can affect your case. Contact us now to protect your legal rights.